CTL's new J5 Rugged Convertible Chromebook offers versatility: It can be used as a laptop or a tablet, and pricing starts at just US$249. The device has an 11.6-inch touchscreen that can rotate to turn into a Chrome OS tablet. It is designed similar to Lenovo's popular Yoga hybrids. At the entry-level $249 price, the Chromebook doesn't boast premium features. 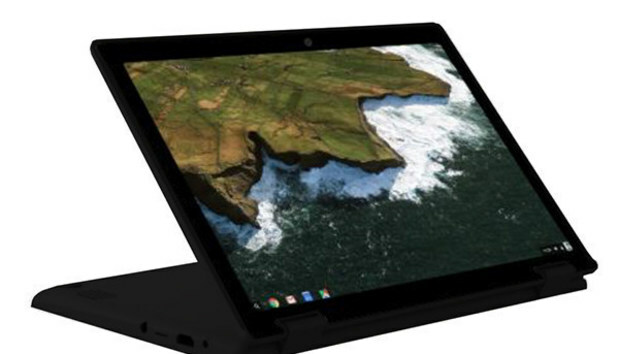 The screen displays images at a 1366 x 768-pixel resolution, in line with other low-cost Chromebooks. The J5 Rugged Convertible Chromebook runs on an Intel Celeron N3050 architecture based on the Braswell chip design. It has 16GB of storage, 4GB of RAM, two USB ports, an HDMI slot, a webcam and a Micro-SD slot for additional storage. The Chromebook's battery life is about 10 hours, according to the company. It is now available for pre-order on the company's Web site. CTL didn't provide a shipping date, and the company did not respond to requests for information on availability. Chromebooks are aimed at people who do most of their computing on the Internet. They run Google's Chrome OS, and touchscreen support was added to the OS last year. Google has promoted Chromebooks as a low-cost replacement to Windows PCs, especially with more people using Web-based applications. Chromebook shipments are growing, especially in the education market, and CTL is releasing its laptop in time for the back-to-school shopping season. The CTL Chromebook has competition from similar models with touchscreens that can flip around to turn the device into a tablet. But there are configuration differences. Asus' Chromebook Flip is priced at $239 on Amazon.com, and runs on an ARM-based processor from RockChip, considered slower than Intel chips for Chromebooks. Acer's entry-level Chromebook R11 is priced starting at $276 on Amazon, but has 32GB of storage. Lenovo's $180 100S Chromebook has a touchscreen, but it can't be used in tablet mode.